Prominent Yemeni journalist, press freedom advocate, and whistleblower Abdulkarim al-Khaiwani was assassinated on 18 March by unknown gunmen outside of his home in Sanaa. Al-Khaiwani was one of Yemen’s most effective journalists. He endured years of harassment, kidnappings, and death threats in retaliation for his outspoken criticism of Yemen’s 30-year dictatorship and his exposés on government corruption. His son, the writer Mohammed al-Khaiwani, witnessed the attack, in which several men on motorcycles opened fire on his father and then fled the scene. Al-Khaiwani is the former editor-in-chief of the pro-democracy online newspaper Al-Shoura. After years of threats and harassment, he was arrested, subjected to a mock trial, and sentenced in 2008 to six years in prison on fabricated charges of conspiring with the leader of an anti-government terrorism cell. and of being a coup-plotter After being tortured during his incarceration, al-Khaiwani received a presidential pardon and was released in 2009. In June 2008, a week after being sentenced to six years in jail, Abdulkarim al-Khaiwani received the Special Award for Human Rights Journalism under Threat from AI UK. 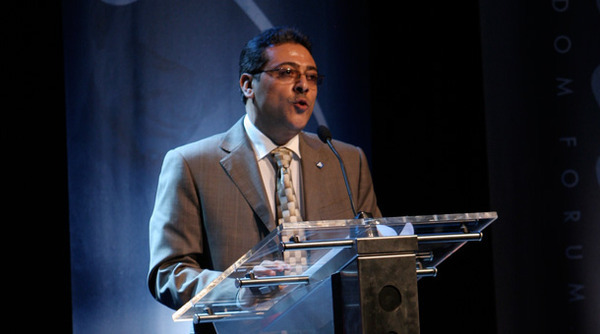 Oslo Freedom Forum Speaker Abdulkarim al-Khaiwani Assassinated in Yemen | News | The Human Rights Foundation.